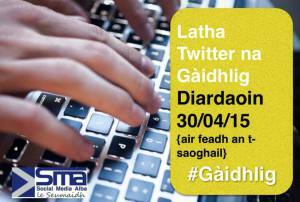 Tha e Latha Twitter na Gàidhlig an-diugh! Feasgar math! Is mise Sìne Bheag agus tha mi ag ionnsachadh Gàidhlig. Tha mi beagan Gàidhlig a-nis, ach ‘s toil leam e.
Rugadh mi ann an Dùn Èideann ach thogadh mi ann an Baile Dhùn Lèibhe. Tha mi a fuireach a Baile Dhùn Lèibhe fhathast. Tha mi ag-obair anns an leabhar-lann. ‘S toil leam campachadh, coiseachd, yòga, biadh agus deoch-làidir 😉 ‘S toil leam ag ionnsachadh Gàidhlig, leughadh agus blogadh cuideachd. Cha toil leam ball-coise, cha toil leam idir! 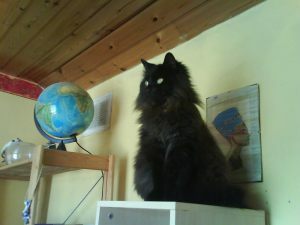 Tha cat agam. ‘S e Punky a th’ oirre, ach ise “Mo Phiseag” cuideachadh. Tha i snog agus tha gàidhlig aice! Ceart ma-thà! Feumaidh mi falbh a-nis. Tìoraidh an-dràsta!